One of the ways Mendeley hopes to change the way we do research is to increase collaboration and connection between researchers across the world, especially in developing countries and places with less access to resources. Blue Ventures is a marine conservation organization committed to rebuilding tropical fisheries in some of the world’s poorest coastal communities. Besides making us totally jealous by sending their lovely photos under the sea, we were interested to hear more about how Blue Ventures uses Mendeley to keep their international group of researchers in the loop with the latest in research. I turn left down a sandy track and arrive at a wooden hut, where there is already a hive of activity. This as you can probably guess, is not just any hut, this is the Blue Ventures Conservation office where an international and eclectic team of marine ecologists, social scientists, health professionals, conservationists, and inspirational community organisers work on a daily basis supporting the development of Velondriake, one of the Indian Ocean’s largest community managed Marine Protected Areas (MPA). This hut in Andavadoaka, southwest Madagascar is just one of Blue Ventures’ offices. Supporting an exciting new movement in grassroots marine conservation means that we have field sites in numerous locations around Madagascar, as well as in Belize. Believing in a holistic and integrated approach to conservation Blue Ventures’ programmes are wide ranging from fisheries science and management to sexual and reproductive health, and from alternative livelihoods to gender empowerment and primary and secondary education. With such a chocolate box assortment of programmes comes a need for knowledge on what is happening in other countries and communities throughout the world. From a novel approach for conducting fisheries stock assessments in data poor fisheries, to measuring the additional value of integrating health and environmental programmes or even a simple how to make sea cucumbers grow faster, all this information needs to be quickly and easily accessible to our field teams so that they can develop ideas to implement in the field. Mendeley – Changing the way research is done. Back in the office and today we are searching out all of the literature that has been written on sustainable financing mechanisms for fisheries management. The short-term nature of many funding programmes means that for community based fisheries management in a remote location such as Andavadoaka to be sustainable into the future, we need to identify ways that it can be supported financially. Our first stop is Mendeley, which allows us to search, organise, store and share all of the literature we find. Mendeley’s ability to create, organise and share large reference libraries means that whether Blue Ventures researchers are in London or Lovobe, Andavadoaka or Ambanja they can share information, ideas and notes on all of the new publications in conservation and development. Bringing new and innovative ideas from around the globe to the remote communities in which we work. Sitting next to me is Lalao, Blue Ventures Senior Blue Carbon Scientist, she is writing a paper on recent findings about the carbon sequestered by mangrove forests in the region. She too is using Mendeley. Having completed her literature review, and having shared her findings online with her collaborating authors she is now using the software to cite other research on carbon sequestration and quickly and easily create a bibliography for her paper. While Blue Ventures supports communities to manage their marine environments, Mendeley is supporting the Blue Ventures team in finding, managing and sharing, the latest literary resources. Meet the Mendeley Operations team! The Mendeley Operations Team helps keep the Mendeley offices going. From providing us with delicious snacks and awesome parties, to hiring great team members and facilitating interesting projects, this team is at the heart of Mendeley’s collaborative culture. This is a perfect time to meet the Mendeley Operations Team, as there is also a chance to meet them in person: We have several open roles here at Mendeley, so check out the job listings and see if you can join the team. We are looking for people to help us on all aspects of our team: web developers & software engineers, data scientists & system administrators, product marketers & business analysts, and more! Mendeley will also be at the Silicon Milkroundabout, 10-11 May 2014 in London. See if you recognize some of those faces there and pick up some great Mendeley merchandise. I am a Chartered Management Accountant at heart, but have built expertise in strategic business planning. I have over 10 years experience in leading, organising and advising high growth entrepreneurial Start-up, Technology and Media businesses. I love start-ups, innovative products and business models that force industries to change. My role has been pretty wide ranging over the last two years, it has included everything from Finance Director to COO, with some commercial development thrown in for good measure. Basically getting things done to ensure the company is successful. Mendeley ticks all the boxes I look for in a company: It has a highly innovative product with huge potential. I get to work with experienced entrepreneurs and I have a role with lots of responsibility and impact. Mendeley has a fun environment and a genuine team culture, it really feels like we are all in the same boat working together to make something great. The ability to get stuff done quickly and have a very real and immediate impact is highly rewarding and refreshing (compared with other larger corporations). I love spending quality time with my wife and son. I studied Political Science and International Relations/Diplomacy in Slovakia, and also finished my masters there. I am currently finishing my CIPD Advanced level Certificate to broaden my knowledge in HR. I moved to London in 2008 to join my boyfriend, who was already living here. I worked as a HR admin/Office Manager for a company called Itim before I joined Mendeley and enjoyed it, so I was looking for a similar role. I joined Mendeley in November 2010 as a HR Admin and Office Manager and shortly developed into a role of Operations Manager, which I’ve done since November 2012. I am responsible for HR and Recruitment at Mendeley. I am also still involved in Operations of Mendeley such as finance-related queries or legal (grant administration etc). I like the start-up environment and the opportunities to learn each day and grow. I did a foundation degree in Tourism & Leisure, and I worked as a guide, hostess, market enquirer, translator and designer of itineraries for tourists visiting our region or going on a ship cruise. I needed to practise my English and came for 8 months. Sixteen years later here I am. I worked in different fields and in different positions. I even worked as a Taxi Controller and a DJ! Office Management found me by chance. It just means that I can use my various magic powers to find solutions and work on several projects at once. I also am in charge of the fun factor in the company which is a very serious matter (not), I need to find places to take the team out, it is great fun. I love my job. I get to work on amazing projects and organise parties! At the same time, I have to deal with the dishwasher or repair the flush in the toilets, so I am never bored. Every day is different and will bring its own challenges with solutions to be found. My job is to make people’s lives easier— if I can, keep a structure that allows us to thrive in a great environment. Meet our April Advisor of the Month! Congratulations and thank you to Godfred Darko! Godfred is not only a fairly new Advisor, but a fairly new user of Mendeley. However, he has dived right into the role and impressed us with his energy. It’s not just the nearly two dozen workshops and seminars he has organized since becoming an Advisor two months ago, but Godfred has also arranged that Mendeley be taught this summer to all the incoming staff at Kwame Nkrumah University of Science and Technology (KNUST), in Kumasi, Ghana, where he is a Senior Lecturer in the Department of Chemistry. Godfred started doing academic research in 1999, and has since completed both his Master of Science and PhD in Chemistry. I was used to Endnote before I went to Rhodes University. I was taught to use RefWorks but I still clung to what I knew to use best – Endnote. I attempted switching to RefWorks only when my laptop crashed and didn’t have a license for Endnote. I heard about Mendeley my first time in 2011 when I went to Ghent University, Belgium. I learned Mendeley in my quest to help out a colleague who was having a challenge with the software. He had used Mendeley for his research in Manchester, UK. But when he returned to Ghana he couldn’t sync his desktop client with his online storage. To understand what his problem was, I installed Mendeley on my PC using my home internet. What fascinated me upon installing the software was its ease to use – my experience on other referencing managers could have been a factor, perhaps. I demonstrated Mendeley to my research students and they were all very enthused about. I also demonstrated to a couple of colleagues and they invited me to teach their research groups. I signed up to become an advisor in February 2014, because I want as many researchers as possible to use Mendeley. Mendeley is very easy to use, gives an online backup and above all is free. It allows me collaborate with my peers and students and also search for papers, people and research groups of interest. Mendeley has placed me on top of my research. I have been holding free hand-on workshops, demonstrations and seminars on Mendeley. So far, I have organized about 20 of such meetings. Mendeley has been very supportive for such meetings and have been giving pens, memo pads, sticker notes and bags to participants as well as PowerPoint presenters to institutional officials who attend. My busy work schedules wouldn’t allow me to read a book outside the field of my expertise. I am currently leaning to play guitar so I have a couple of books on guitar scattered around my bed. I am a workaholic and it’s not funny! The best part of being a researcher is getting recognized. I get excited when my work gets published or is cited by others. The worst experience is when your manuscript gets rejected by a journal. Rejection of a manuscript by a journal is very usual though in research cycle. It happened to me yesterday but with Mendeley I can re-format my reference with just a click to be submitted to another journal. Mendeley is an indispensable modern research tool. Today we’re very pleased to announce the latest update to Mendeley for iOS. This release brings a refined user interface, that is designed to feel at home on iOS7 and above, but still retains the familiarity and usability of the previous design. It’s currently rolling out slowly on the app store, but should be available worldwide in the next few hours. If you like the new version, please help us out and leave a rating or review on the app store. It helps us out immensely. Unfortunately, this is the end of the road for our iOS5 users, so if you’re one of the few people on an iPad 1, we’re really sorry. You’ll be able to use the previous version of the app if you have them installed already, but it’s lifespan will end later this year when we retire the old APIs that it uses. If you can justify it, the iPad Air and iPad mini’s are worth the upgrade. This version supports iOS6, but the number of users who have this installed has dropped significantly since iOS 7.1 was released (far quicker than we anticipated), so you can expect support for iOS6 to be phased out within the next 3-6 months, and definitely when iOS 8 is released. We will continue working hard to bring you great updates, as quickly as we can manage. We can’t get too specific yet, but we are taking all your feedback seriously, and the app will continue to improve a lot over the course of this year. We want to make it easier to import documents to your library with metadata lookups, web importer support and the ability to manually add references and folders. We also want to improve search and filtering options, improve annotation capabilities further, and improve the experience for users who are new to Mendeley. We’ve now hired a lead Android developer, and are still hiring additional developers for that team. Design has been ongoing for the last couple of months, and development will begin in the next couple of weeks, and we’ll be keeping an open dialog with the community about our progress. Please understand that we won’t be rushing out an app quickly. This would result in a poor quality experience and no one wants that. Based on our experience with iOS, we are expecting to deliver something towards the end of this year. On the Mendeley blog we’ve often talked about ways that crowdfunding is helping to finance some important research projects. This month’s guest post features a campaign which already surpassed its goal of raising $300,000 to enable a study into a treatment for Multiple Sclerosis, using stem cells to potentially repair the damage caused by the disease. MS affects over 2.3 million people worldwide, with about 200 more being diagnosed every week. The Tisch MS Research Center in New York (Tisch MSRCNY) is dedicated to finding the yet-unknown cause of this devastating illness and eventually curing it. Here they talk about their work and what they hope to achieve. In August of 2013, our non-profit laboratory and research center received FDA approval for a groundbreaking Phase I Clinical Stem Cell Trial. This exciting milestone took over ten years of research to achieve and brings indescribable hope to MS patients and their loved ones all over the world. The study utilizes adult stem cells harvested from the patient’s own bone marrow and attempts to repair the damage caused by multiple sclerosis. This trial is the first of its kind to be approved in the United States. Funding is like oxygen for research. Without financial support, our research into regenerative therapy cannot survive. Since Tisch MSRCNY has not received federal, state or corporate funding to cover costs of this study, they decided to use Indiegogo to secure the critical funding that is needed to take this forward. Tisch MSRCNY launched its first crowdfunding campaign on Indiegogo.com last month, spearheaded by newly elected Chairman of the Board of Directors, David Greenstein. David also provided the inspiration and hope illustrated in the video that was created for this campaign. “It was only natural to turn to the industry-leading capabilities and international reach of Indiegogo to help bootstrap the crowd sourcing needed to enable this important clinical trial,” stated David. The campaign reached its minimum goal of $300K but is still seeking support to fund the study, so people can continue to get in touch for more information and ways to help the work even after the official closing deadline. They can also do this via the Tisch MS Research Center Website. Since the launch of the Indiegogo campaign, the cutting-edge research being conducted at Tisch MSRCNY has received more awareness. The center has achieved a greater presence on social media and has connected with the top MS bloggers who have helped spread the word about this important initiative. A sense of community has developed as patients, friends, supporters and philanthropists have to come together to give this mission wings to fly. The most popular campaign perk has been the Stem Cell Star which features a photo of stem cell harvested in the Tisch Laboratory. Other perks include Article Dedication in which a donor will be acknowledged in the next research publication by a Tisch MSRCNY researcher. There are also opportunities to spend an Evening with the Researchers and take a Private Tour of the Tisch MS Laboratory with Dr. Sadiq. We’re interested to hear from the Mendeley community about any crowdfunding initiatives they are involved with or perhaps about research they are considering for crowdfunding. Do you think that these new ways of funding medical research are important, or are there concerns that need addressing? Let us know your thoughts in the comments! Wow, it’s now already one year after Mendeley was acquired by Elsevier, and as it’s probably common, I would like to take the opportunity to reflect on the past 12 months, and tell you a little bit about the insights and how I think about Mendeley and Elsevier one year into the acquisition and what we’ve achieved so far. Coming back to our joint plans and commitment from both Elsevier and Mendeley, in 2013 alone we hired about 15 more people, and this year we will hire at least another 20 staff. 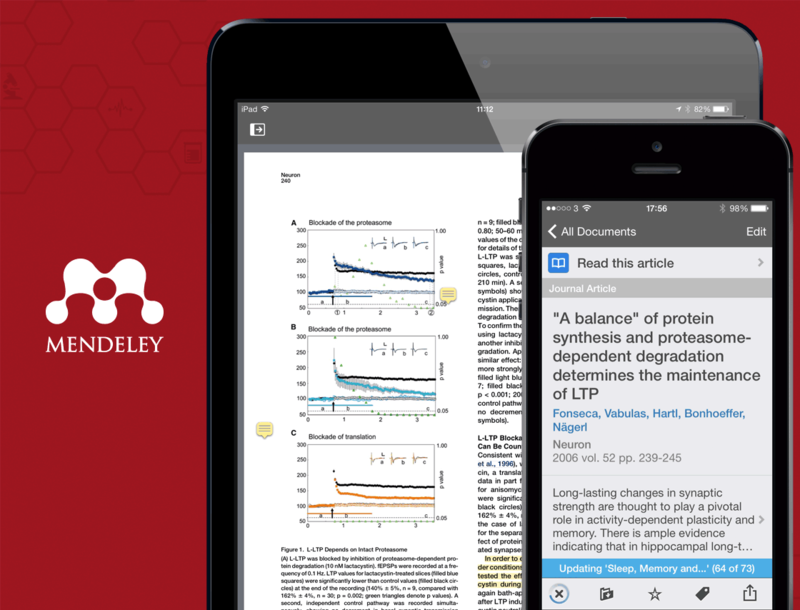 This allowed us to bring out a new Mendeley iOS version (and we’ve recently started to build our Android team – it’s one of the most requested features on http://feedback.mendeley.com, so yes – we continue to listen! ), to continuously iterate on new Mendeley Desktop versions (with cutting-edge features), and also to support the Open Source CSL Project. We’ve also started work on a new web library, will improve our institutional offering MIE (Mendeley Institutional Edition, which institutions like MIT have adopted), and are currently completely revamping our APIs including the open API for third-party developers, with Mendeley Desktop also moving to these new APIs. Of course, on the back-end, the Mendeley engineering teams are also busy ramping up Mendeley’s scalability and security, to keep up with our growth! We integrated with existing Elsevier products, such as ScienceDirect and Scopus, which let millions of researchers use these products jointly much more efficiently (a seemingly small feature, but if you look at usage and how much time we save people, it’s quite impressive! ), and Scopus has integrated Mendeley readership statistics, bringing more visibility to “alternative impact metrics”, or “altmetrics”, a movement which Mendeley helped to kickstart after all. … Wow! Quite a long list! But we don’t stop there – Mendeley has also continued to support all kinds of open science efforts publicly, and just generally we continue to try to make positive contributions, and foster a challenging, high-tech, and vibrant company culture (with some pretty cool stuff coming out of our monthly hack days! ), something that Elsevier was really interested in learning about and is actively trying to absorb. We push for openness, engage with our users and Advisors as much as before, and in many ways remain a leader in different types of discussions in the academic community. Our joint teams have also participated in and positively influenced company-internal policy discussions, around what a publisher like Elsevier should allow regarding academic social networking sites, etc. And right after the acquisition, we’ve increased the storage limits, and through the Elsevier sales team we’ve brought much more free Mendeley to many more end-users than we could have done on our own – and yes, Mendeley’s freemium model will remain. It’s of course not all sunshine and ice cream (especially not in London…). Some of the things that have consumed our energy without much visible impact are the more corporate structures that have come our way, for example “back-office integration”; or more meetings with and sign-offs by more people (Elsevier is very consensus-driven); or more systems and processes with more approval layers, which has slowed us down, etc. But I can proudly say that the Mendeley team, with support from within Elsevier (! ), has so far bravely fought the start-up fight against corporate structures, and we’re still running on Google Apps for Business. All-in-all we’re actually doing pretty well (see above) and have a great team spirit between the teams, considering what many times happens when a big company buys a small company. It’s maybe also just being part of “Mendeley growing up”. So what’s ahead? The Elsevier/Mendeley team is now building a complete and highly engaging collaboration platform for researchers and scientists. Researcher-centricity has always been at the heart of what Mendeley stood for. And Elsevier has filled crucial “blind spots” in the product portfolio – we can now bring value to scientists along the whole workflow, from excellent high-quality content, to search and (social) discovery, evaluation, reading, storing, sharing, and annotating articles, submitting manuscripts, and networking with colleagues. By pulling together the different products and assets, we can leverage more data to deliver and drive more and better content (incl. third-party publisher content – Mendeley has always been publisher-neutral) to the right users, increase researcher productivity, and make it an awesome experience! The next steps on this journey are further product integration between Elsevier and Mendeley, working with additional publishers, and bringing Mendeley to more institutions around the world. Concluding, I’m still impressed by the user love we get weekly, if not daily, from our team, our Advisors, and our users who I ask to continue to support us, challenge us, and to keep us on our toes, as that gives us as the Elsevier/Mendeley team leverage within the wider context of the much bigger company we’re part of now. Mendeley is a great company to work for and it’s a great team deserving this support. I really believe that all our efforts, before but also now jointly to some extend with Elsevier, have made science more open, collaborative, and accessible, in addition to making our users just simply more productive. I’m proud of everyone who has helped to create Mendeley, who has built bridges between Elsevier and Mendeley, who has helped us and challenged us on this journey – the academic world without Mendeley would certainly look different. PS: If you are interested in more background information, I’ve participated in a podcast a few weeks back about “Life after the acquisition” – you can listen here for more and BBC Radio 4 also broadcast a very interesting documentary today where I explain some of those points in more detail.